Park directors, schools and landscape architects love custom playgrounds that make their park stand out. 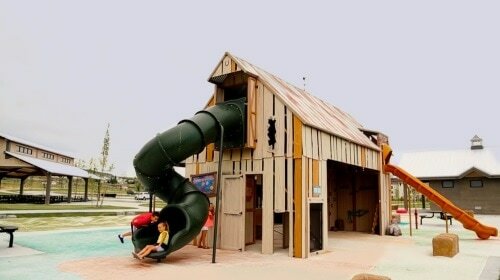 Big T Recreation specializes in building commercial recreation equipment that kids and families love! Whether you’re building or rebuilding a playground for a school, city park, housing development or apartment complex, we help customers build an outdoor play structure that is perfect for kids of all ages and situations. If you’re looking for playgrounds, pavilions, splash pads or playground safety surfacing, Big T Recreation offers unique, durable and inclusive options for you to choose from. Call us today at 801.572.0782 or request a free catalog! Design & Review - Choose your customized playground equipment, design, and color. (We’ll help you!) Then review a visual rendering of your playground. ​To get started, call Big T Recreation at 801.572.0782 or request a free catalog! At Big T Recreation, we do unique custom projects. 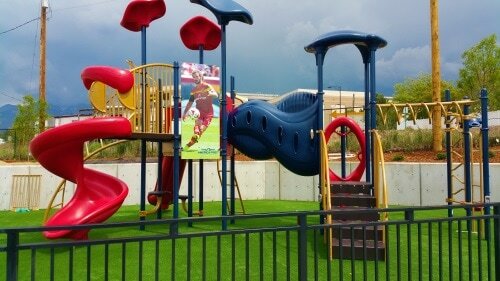 We built this playground specifically for the Real Salt Lake professional soccer team. Big T Recreation worked hand in hand with Real Salt Lake Soccer to create a play environment that matched their athletic vision. Contact Big T Recreation for your own customized project. If you want your school's colors to match the playground, we can do it! Or if you want a custom picture printed right on to the playground we can do that too. 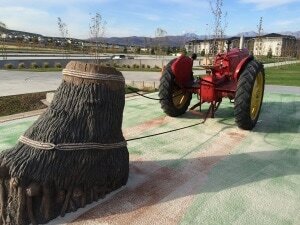 This incredible park celebrates Draper's farming heritage. Gene and Deane Wheadon ran a working farm on this land for nearly 100 years and now it's one of the most amazing parks in the state. Stump-pulling big red play tractor. 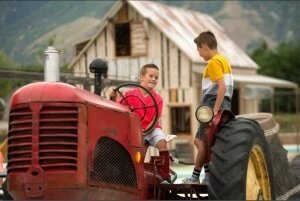 ​Wheadon Farm Park is a must visit. Located at 14125 S. Bangerter Parkway Draper, Utah. If your city or town is looking to revitalize your community, give the design team a call at Big T Recreation. Take part in the process as we construct a playground that will be remembered. ​Big T Recreation and Cre8play specially designed each custom playground piece to be unique, fun, and accessible. This all-ages park entertains the entire family. When you build your playground with Big T Recreation the sky is the limit! At Big T Recreation, we start with you. We want to hear what ideas you have for your playground. With your help, we pack as much play value and fun into each park. 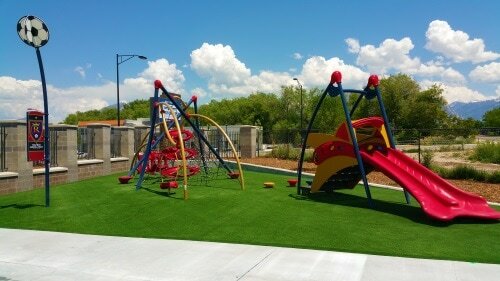 This park features some of our best sellers, including the Spinami and the Play Web. If there is a certain product you want in your playground, we can make it happen! We also have a large selection of custom colors. 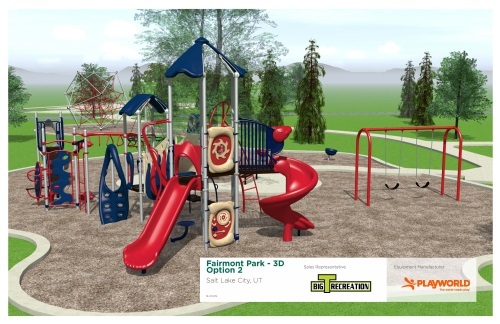 We will provide a 3-D digital rendering prior to order that will help you visualize and make adjustments to your perfect playground. Our playground equipment is manufactured right here in the USA and is shipped from Lewisburg, PA. We have a installation crew that specializes in playgrounds and we offer a wide selection of safety surfacing options that will provide the look and feel you've always wanted in a playground. We also provide a large array of site furnishings including benches, pavilions and drinking fountains. We pride ourselves on our customer service and we aim to bring you the best possible information and products. With Big T Recreation you get the unique, first, and best!